Eslem Öztürk joined Besiktas JK youth academy in 2013 from a small club Gölcükspor. He is regarded as one of the most talented teenagers in Turkey. 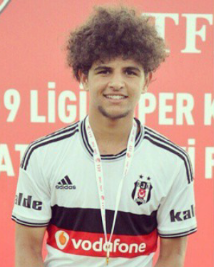 He made his professional debut for BJK on 2 February 2015 in a Turkish Cup game against Caykur Rizespor. He didn’t make his debut in Süper Lig, but it seems to be just a matter of time before Şenol Güneş gives him a chance to play for “Black Eagles” in a league game.